It is always nice to see a skater who has given it their all, but never quite been able to break into the elite ranks, enjoy success on a big stage. Such was the case last week for 19-year-old Rin Nitaya, who claimed the silver medal at the Winter Universiade in Almaty, Kazakhstan. The Winter Universiade is staged every two years and features student-athletes age 17-28 from over 50 countries. Many of these competitors will go on to succeed in business and life, but may not get the athletic accolades they so desire because they don’t quite have the skill level of some of their contemporaries. That doesn’t lessen their love for sports any less, however. Nitaya’s story is truly heartwarming. The Nishinomiya, Hyogo Prefecture, native has been around for years, but to this point has not even garnered a senior Grand Prix assignment. In fact, she has skated in the junior ranks for the past four seasons, often against much younger competitors. Skating in the shadow of Japan’s best, Nitaya was 11th at the Japan nationals in Osaka in December, but was given the chance to represent the Hinomaru at the Universiade by the Japan Skating Federation. With time on her hopes of making it into the big time running short, Nitaya made the most of her chance in Kazakhstan’s largest city. Third after the short program, Nitaya put on the performance of her life in the free skate to “Legends of the Fall,” landing seven triple jumps to move up and earn the silver medal behind Russia’s Elena Radionova (who won with a total of 196.61 points). Wearing a beautiful charcoal gray outfit, Nitaya won over not only the Kazakh crowd, but the Eurosport announcers of the event as well, with a rapturous performance. The Eurosport team cited Nitaya’s quick action in changing jumps after she had singled a triple lutz midway through her free skate on the way to a personal-best score of 187.18. “Around the middle of the program she made a mistake on one of her jumps,” said the Eurosport analyst. “That was meant to be a triple lutz, which is the highest value jump she has in her program. By missing that and just doing a single, she loses a lot of points. “So later on instead of doing a triple salchow, which is worth a lot less than a triple lutz, she swaps those two around and tries to gain those points back,” the analyst added. The analyst then mentioned the opportunity provided by an event like the Universiade. “What I love about this competition is that it gives skaters that compete for those big figure skating countries, like Japan and Russia, a chance for their skaters that perhaps don’t make it into the world teams to have a performance on the world stage,” the analyst stated. “This competition is great because it’s a great opportunity for skaters to compete in a multisport competition. It’s something that is similar to the Olympics and it’s the only one of its kind. Akiko Suzuki choreographed Nitaya’s programs and really brought out the best in the youngster with her efforts. 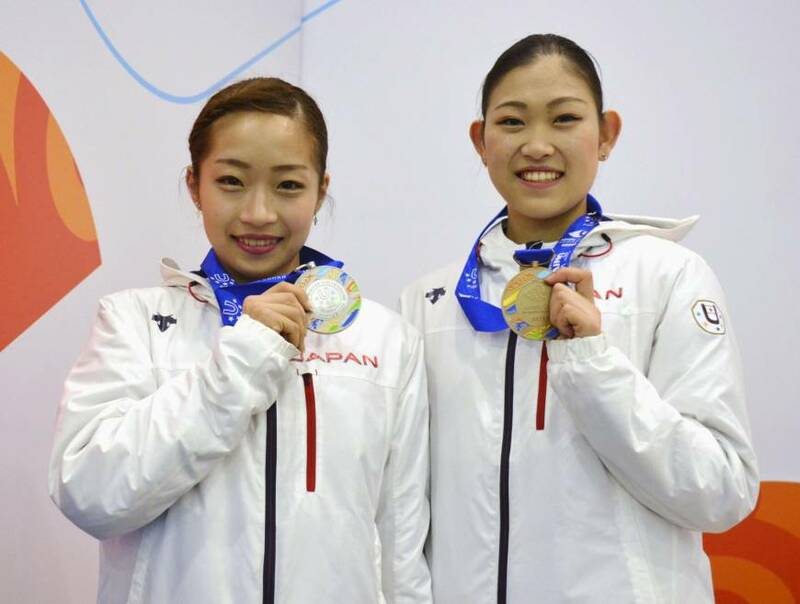 Adding to the good news for Japan was the showing of the unheralded Hinano Isobe, who rose from fifth after the short program to join Nitaya on the podium by capturing the bronze medal with a tally of 174.27. Isobe, a 19-year-old who also attends Chukyo University, has also been on the scene off and on for several years. She placed 16th at this season’s nationals. Given the chance at the Universiade, Isobe put on an elegant and mature performance in a sharp black and gold outfit to “Ryomaden.” The native of Kusatsu, Shiga Prefecture, was so overwhelmed by her effort that she began to weep before she could even bow to the crowd after her free skate. Once again, the Eurosport crew was impressed by the skill of a Japanese skater. Isobe’s spins gained considerable attention from the announcers and judges, who gave her two level-fours. “She is a very pretty spinner. The positions she created in those spins were very, very nice and athletically pleasing,” said the analyst. “. . . Definitely a great performance. I really enjoyed that. The praise continued when the analyst summed up Isobe’s free skate. Adding to the haul: Keiji Tanaka gave Japan half of the singles medals at the Universiade when he grabbed the silver medal in the men’s singles. Tanaka placed second behind Kazakhstan’s Denis Ten. Ten, the bronze medalist at the Sochi Olympics, won the competition on home ice with a total of 266.97. Tanaka, who was third at this season’s NHK Trophy in Sapporo behind Yuzuru Hanyu and Nathan Chen, posted a personal-best score of 252.09. Sweden’s Alexander Majorov took the bronze on 246.56. The 22-year-old Tanaka, a student at Kurashiki University of Science and Arts in Okayama Prefecture, landed his opening quadruple salchow in his free skate, but fell on his planned combination quad salchow/double toe loop. Tanaka recovered to land six triples jumps, however, while competing to a selection of music from Federico Fellini films, and held on to second place after the short program despite finishing third in the free skate. Russia dilemma: Something interesting happened late last month in the wake of U.S. Figure Skating Association president Sam Auxier’s statement at the U.S. nationals in Kansas City, Missouri, that Russia should not be allowed to compete in the Pyeonchang Olympics in the wake of the Sochi doping scandal. During a January 19 press conference at the 2017 U.S. Figure Skating Championships, U.S. Figure Skating president Samuel Auxier was repeatedly asked by an American journalist for his opinion on what disciplinary action, if any, should be taken against Russian athletes who may be proven to have used substances on the World Anti-Doping Agency banned list. Auxier shared his personal opinions, which have been reported by the media. These opinions were Auxier’s own and not the official position of U.S. Figure Skating. U.S. Figure Skating’s position is to await the IOC and ISU’s decision on this matter, and U.S. Figure Skating will abide by the findings. The reality is that the time is ﻿﻿ drawing near for the ISU and IOC to decide on Russia’s fate for Pyeongchang. If Russia is not going to be allowed to ﻿﻿ compete in any sport, the announcement should be made soon, so the athletes know what their fates are. Ice Time believes that there must be a very severe sanction against Russia over its doping conduct at the Sochi Games. It is bad enough to have state-sponsored doping any time, but to do it while hosting the Winter Olympics was the height of hypocrisy. I think there are only two scenarios that would be just punishment for what has gone on. The first option would be to ban Russia outright from competing at the Pyeongchang Games. This would clearly have a significant impact on the competition and medal table in South Korea, but would also punish a great many who had no involvement with the Sochi scandal. The second, and I feel better option, is to strip all of the Russian medals from Sochi. This is more palatable, because is sends the message that this type of behavior will never be tolerated again, especially by a host nation. It would also close the books on Sochi once and for all. Some will say that stripping all of the Russian medalists from Sochi would be unfair to those who didn’t dope, but I’m afraid that is the price that should be paid for what went on. You can’t turn an entire global athletic competition into a farce and expect to get away with it. There should be no suspended sentence like we so often see in the Japanese judicial system. The penalty given to Russia must be profound and stick. Anything less and the ISU and IOC will have lost all credibility.